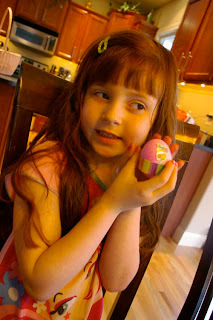 It was about 30 degrees outside all day on Easter Sunday (we even saw some snow flurries through the window), so it was really no weather for outdoor Easter Egg Hunts or any other activity of the sort. But we made the best out of our holiday by preparing some fun indoor activities for the kids. 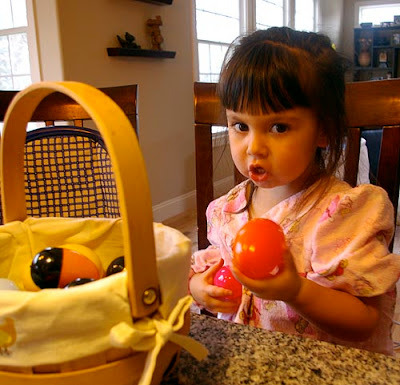 First, we did an indoor egg hunt. Jon & I got up before 7 am because we knew the kids would be up soon after and hid 40 eggs all around the first floor and basement of our house. It was amazing to see those girls work their magic... they found all 40 eggs within 5 minutes (with very little help from mom & dad!) ;) I didn't get to take pictures of the egg hunt because it happened so fast, but here's a picture of Sydney proudly displaying 2 of the 18 eggs she found on her own. Finally, we made a little yummy project that we borrowed from my friend Ash (infullbloom). 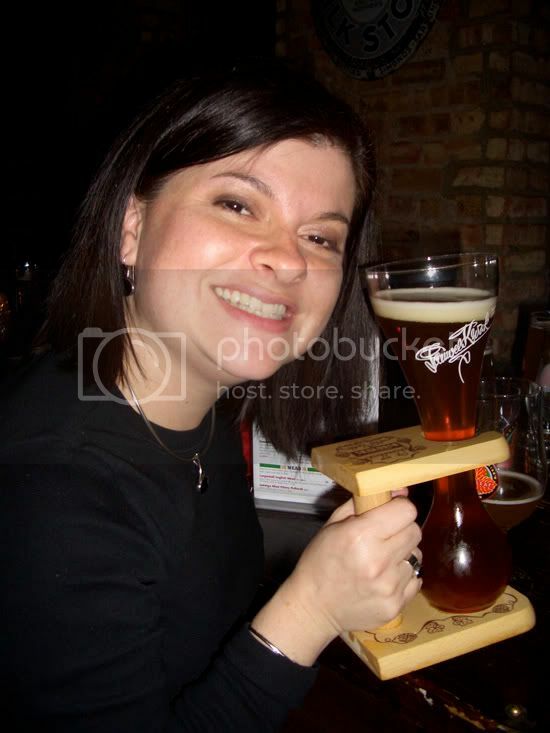 She had the most wonderful idea and I knew that the kids would just love it! 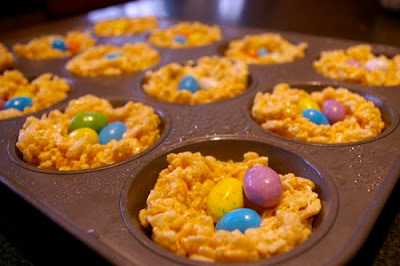 We prepared the "rice krispy treats" mixture and placed it on a muffin pan forming a "bird's nest" look. 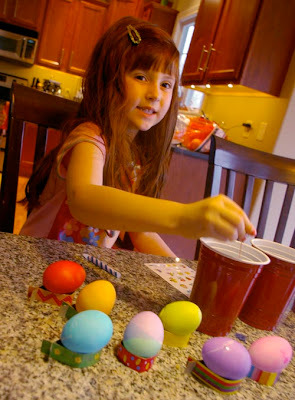 Then after they were cool enough the girls had a blast adding all the little "baby eggs" to the nests. 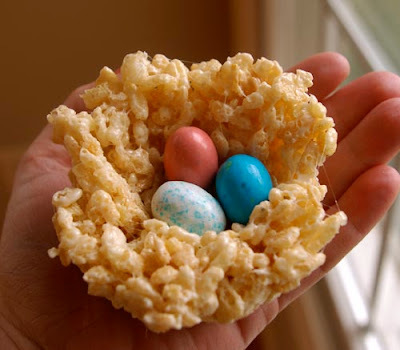 We used Whoppers Mini Robin Eggs for ours (because I LOVE malted milk candies!) They turned out soooo cute! 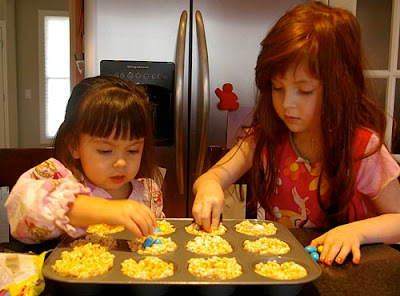 :) You can find the full recipe for this delicious and fun-to-make treat here on Ash's blog. In the afternoon, in between all the Easter-related activities, I even had time to squeeze in a little studio project. I'm so excited about it and will share pictures as soon as it is finished. Jon's dad was down here for the weekend, so he helped me do the carpentry part of it and I did all of the painting and sanding. I love PJ Days! So comfortable. Hey, Jon's an amazing cook. Tell him we're flying in for dinner - LOL! Your children look so pleased, and the treats are surely pleasing!!! I LOVE malted chocolate! I bought a big bag of the eggs, and went back to get more... all gone. Wow, what a day! And um...can you loan Jon out to fix the rest of us a meal or two? LOL...that dinner sounds divine!